BREAKING: Damning affidavit from world-famous dam expert Harvey Elwin (from the First Nations injunction case in BC Supreme Court) warns of major delays at Site C.
Please read our post on this major development here. We attended the final week of the Supreme Court injunction hearing for the Treaty 8 First Nations in their case against Site C. See a complete live-tweet of the proceedings here. Now we await the judge’s decision, like to come down by late October. This is a David vs. Goliath case, but it’s also a strong case. On May 9, 2018 in BC Supreme Court, the federal Justice Department issued an Application Response containing the unexpected statement that it will not be opposing the injunction filed in BC Supreme Court by West Moberly and Prophet River First Nations. That is, it won’t oppose First Nations’ request for all work to stop on the Site C Dam until their civil suit alleging infringement of Treaty 8 is heard. The Union of BC Indian Chiefs has today issued a call to John Horgan and the BC NDP government to follow Canada’s lead and stand down. 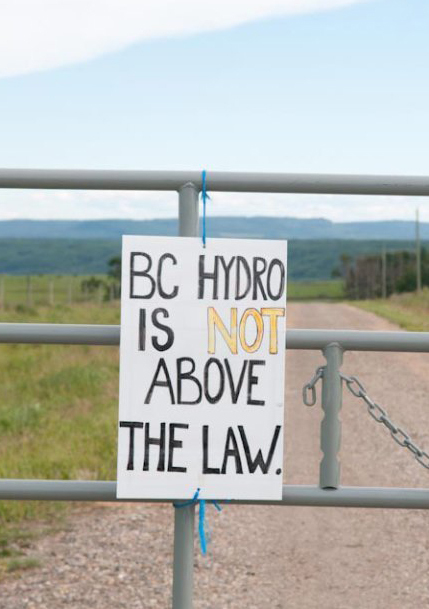 The BC government and BC Hydro have until this point between opposing the injunction in a number of ways, including asking the court for removal of expert testimony from the case. The affidavits they object to are by former BC Hydro CEO Marc Eliesen (arguing he’s not sufficiently expert, despite having been CEO of BC, Manitoba and Ontario Hydro utilities and Ontario Deputy Minister of Energy) and Joint Review Panel on Site C Chair Harry Swain (accusing him of “bias”). That the BC government and BC Hydro could also be accused of lack of expertise (Hydro has not built a major dam in over 40 years) or bias did not stop the SC judge in the case from allowing the removal of these documents from the case (the documents will however be amended and resubmitted). The federal government’s move is excellent news. We too call on Premier Horgan, BC Attorney-General Dave Eby, the NDP government and BC Hydro to stand down and follow Canada’s lead. We thank the Attorney-General of Canada Jody Wilson-Raybould and the Justice Department for respecting First Nations, UNDRIP, FPIC and Reconciliation in this matter. The Site C Dam was passed by the BC NDP government on December 11, 2017. This will likely mean an eventual doubling of hydro rates for every British Columbian and will significantly increase BC Hydro’s catastrophic debt. We’re already on the hook for BC Hydro’s pre-existing debt of $26 billion and counting. Site C is the straw that will break the camel’s back. Site C’s costs are spiraling out of control. The dam began as a $6+ billion project, but many experts now say it will cost well over $12.5 billion. Others have said that like Newfoundland’s similar Muskrat Falls dam, its cost will likely exceed $20 billion. We have already had a decade of BC Hydro financial mismanagement under the prior BC Liberal government. BC Hydro’s debt tripled during the last 10 years of BC Liberal rule, largely through forcing Hydro to buy private power from IPPs (Independent Power Projects, or private dams on numerous BC rivers). Hydro execs also gave themselves huge salary increases. And because they consistently overestimated energy needs every year for decades, Hydro overproduced power at a huge cost to you. BC families will be forced to pay back billions of dollars in debt. Taxpayers will suffer to keep the company’s—and the province’s—credit rating whole, to keep our economy functioning. The Site C Dam will add another $12.5 billion in costs to BC households at least—that’s an almost inconceivable sum. It’s equal the total annual household income of 164,473 British Columbian families. It’s 1/3 of the annual BC budget of $34 billion—and that’s only if it doesn’t go further over-budget. We’d like to give you much more detail on how this economic quagmire will affect you, but. BC Hydro can’t even tell us the final cost of Site C.
If Site C is completed, every household could see their rates double. This calculation comes from two reputable experts. Eoin Finn, who is a former KPMG senior partner with a speciality in energy utility finances, and Harry Swain, former Chair of the 2014 Joint Federal-Provincial Review Panel on Site C.
Is it too late to stop Site C, now that the BC government has passed the dam? No. There are still a number of roadblocks in front of this dam’s completion. The first is that Site C is a violation of Treaty 8. Both the BC government and the Government of Canada have committed to UNDRIP and Reconciliation. Furthermore, the two most closely affected First Nations, the West Moberly and Prophet River First Nations, have a civil court injunction to stop Site C that will be heard in BC Supreme Court in July 2018. This is a strong case, and Commons BC will be reporting on it extensively. Second, there are severe geotechnical difficulties at Site C, and these are the main cause of the projects delays and very costly budget overruns. There two other dams on the Peace River—the WAC Bennett dam and the Peace Canyon dam—but these are situated in the Northern Rockies and are built on bedrock. Site C is built on some of the most unstable ground in the province, a combination of shale and silt known as “shilt.” The project has already been plagued with slides and tension cracks. Instability is one of the reasons why Site C was already rejected by BC Hydro several times over the past 40 years. When will the cost of the slides be too much? When will the riskiness of the dam—if in fact it’s possible to build it at all—be too much? Stopping Site C now, when the project is only 20% completed and nothing has actually been built except some portable housing, will save taxpayers form wasting money for energy we don’t need. Stop Site C to support more jobs—and more families—in our province. Because if the province is forced to put more money into this quagmire, there will be less money for other infrastructure jobs, health care and other needed service and amenities all around the province. Find out more about why Site C is bad for our economy, bad for jobs, and bad for British Columbian families.